It's your birthday, my friend, and for you, your wonderful husband and of course that cute dog. 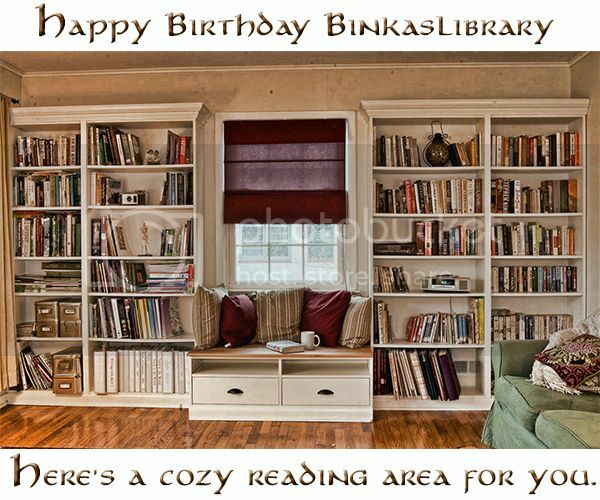 I found the perfect picture for your card - a cozy library and seating area for you to incorporate into your new apartment. May your new home be filled with nothing but joy and may your next year be the most fulfilling one for you yet. Lovely photo. Would love that room. Oh wow! What a nice place for books :) We don't have bookcases yet, so who knows... ;) Yes, there's a much controlled chaos here, but still, it's nice to be here finally.